Waist Training! Are there lurking dangers? Whether getting the much craved hourglass figure, losing post-pregnancy bump or losing abdominal fat, waist trainer dangers cannot be overemphasized. Yea, many people want to get a banging shape. We want to look attractive and make jaws drop. No wonder the hour glass shape is trending. And those people many of us look up to fashion- wise, keep flaunting it across social media platforms. The danger that lurks within, is that many people buy into it and are misled with their eyes blind to the dangers of waist trainers. 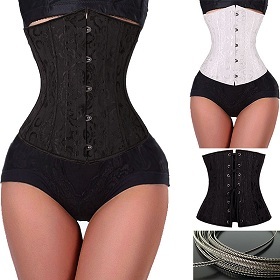 What are the cons of waist training with waist trainers? Are there associated health implications? Is it right for me? Despite celebrities flaunting and endorsing it? Now, if you have asked yourself these questions, you are one step close to getting the answers. So let’s do a bit of practical here. Get a tube of toothpaste, squeeze it at the middle. What do you notice? There would be an upward and downward displacement of the paste at the middle. 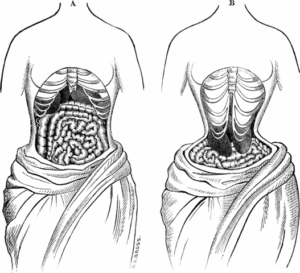 With this, there would be an anatomic distortion and displacement of the organs from their rightful position which would consequently produce the devastating effects of waist trainers. The upward force it exerts pushes the diaphragm higher up, thereby reducing the thoracic cavity(where the lungs are found), this could make breathing difficult because of the reduction of air going in and coming out of the lungs. Some Victorian era women had been reported to faint because of shallow breathing, though this represents extreme forms. You could also be predisposed to pulmonary oedema or lung infections like pneumonia, as a result of fluids in the lungs. Gastric reflux which could result to heartburn could also be a feature, because the increase in abdominal pressure could affect the sphincter(valve) that prevents regurgitation of contents from the stomach to the oesophagus(the tube that brings food into your stomach). People with weak pelvic floor muscles are strongly advised against trying this out, the pressure could weaken the pelvic floor muscles and predispose to prolapse. We are glad you now know how waist trainer dangers could affect you, so when waist training, make the right choices.